<b>Arch swindler. Conman. Survivor. Poseur.</b> Between American business, organised crime, the CIA, the Pentagon and four White House administrations, Ferdinand Marcos was able to maintain his iron grip over the Philippines for over two decades. During this time the Filipino lawyer-turned-President and his First Lady, Imelda, accumulated vast wealth and transformed the islands into a gaudily-masked criminal hub. Brutality and sordidness went hand in hand, yet it was only after &#x201c;people power&#x201d; toppled the Marcos dictatorship in 1986 that the world learned the true extent of their depravity. That, and of Imelda&#x2019;s 3,000 pairs of shoes and bulletproof brassiere. In investigating figures known for manipulating histories and facts to suit circumstances, Sterling Seagrave untangles a web of truths and untruths to reveal the <em>hows</em> and <em>whys</em> of <em>The Marcos Dynasty.</em> It is an account rivalling the richest of political thrillers ... and is all the more compelling for its veracity. <p><b>Praise for <em>The Marcos Dynasty:</em></b></p> &#x201c;[A] merciless account of the Filipino dictator&#x2019;s rise and fall.&#x201d; &#x2014; <b><em>Time</em></b> &#x201c;Offers a wealth of new information about the personal lives of &#x2018;Ferdy&#x2019; and Imelda ... a couple who were not just greedy beyond belief but also deceitful, ruthless and embarrassingly tacky ... Seagrave delivers the goods.&#x201d; &#x2014; <b><em>UPI</em></b> &#x201c;Fascinating.&#x201d; &#x2014; <b><em>The Philadelphia Inquirer</em></b> &#x201c;Seagrave&#x2019;s history of how the Philippines&#x2019; former president and first lady managed to become so awfully corrupt and so immensely rich and powerful will satisfy the cravings of those addicted to such tales &#x2014; which may include just about everybody.&#x201d; &#x2014; <b><em>The Washington Post Book World</em></b> &#x201c;I found The Marcos Dynasty fascinating reading. Of particular interest was his detailed examination of Marcos&#x2019; connections to the so-called Yamashita Treasure. He provides a detailed examination of Marcos&#x2019; ties to top CIA, Mafia, business, and political leaders in the United States as well as in Japan and several European countries. 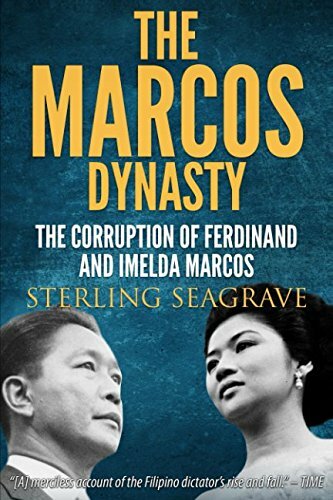 While parts of The Marcos Dynasty read like a fast-paced thriller, there is an underlay of thorough investigative work.&#x201d; &#x2014; <b>Lewis M. Simons, author of <em>Worth Dying For</em></b> &#x201c;The Marcos Dynasty tells a story that is so slimy, sleazy and bizarre that it reads as if Seagrave were exposing underworld characters in some powerful crime syndicate. Sadly, of course, he is.&#x201d; &#x2014;<b><em> The Boston Herald</em></b> &#x201c;There is much that is fresh and invigorating about Seagrave&#x2019;s book &#x2014; he is a fine writer with a good eye for drama. And there is much drama to mine out of the Marcos story ... Gripping and very persuasive.&#x201d; &#x2014; <b><em>Newsday</em></b> <b>Sterling Seagrave</b>, grew up on the China-Burma border in the 1940s (his father was Dr Gordon Seagrave, author of Burma Surgeon). He is the author of <em>Yellow Rain, The Soong Dynasty, Dragon Lady,</em> and <em>Lords of the Rim</em> and has written many articles for major newspapers and magazines. He lives in Europe.